Clackamas' Ciara James scored a game-high 17 points and Alyson Miura added 16 to pace five players in double figures, leading the Cavaliers to 74-27 Mt. Hood Conference home blowout Friday over the Centennial Eagles. Maddy Filler came off the Clackamas bench to score 12 points, Kalani Hayes had 11, and Elly Bankofier chipped in 10 as the league-leading Cavaliers (18-1, 9-0 Mt. Hood) won their 11th consecutive game and fourth in a row by more than 40 points. "Every time we step out on the floor, we have a goal to get out of the game whatever we can, no matter what the score is," Cavaliers coach Korey Landolt said. "It may be that we work on nuances in our offense or try some different strategies on defense. "I kind of feel that a lot of these games that have not been close games have still be productive games." Clackamas backup post Savannah Duarte missed the game for personal reasons and the Cavaliers also lost reserve guard Olivia Morris to an injury in the first half. 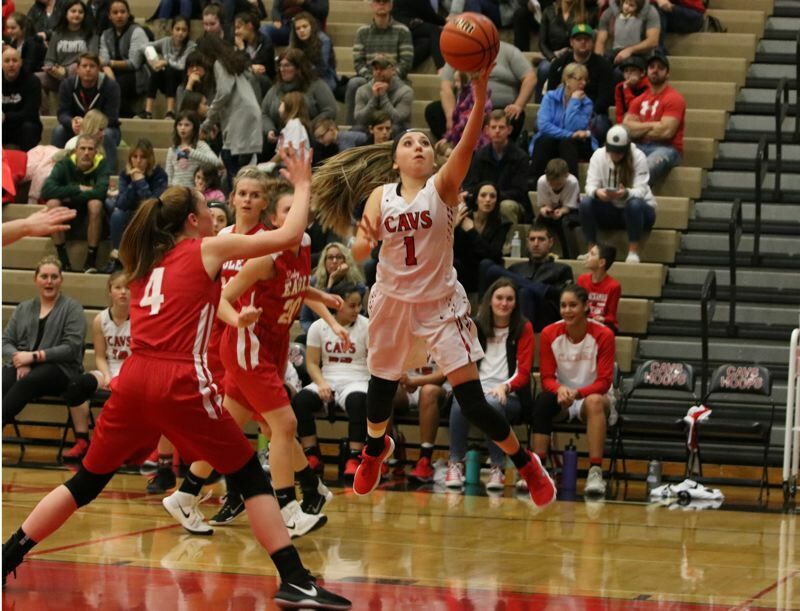 Miura scored 12 first-quarter points as Clackamas jumped out to a 27-7, and then James added six in the second quarter when the Cavaliers extended the lead to 47-15. "We shot pretty well in the first half, but we missed some in the second half that were lack-of-focus misses," Landolt said. "In the third quarter, Centennial played us even, but at the same time I felt we got some good learning down while playing around with different defenses and players in different positions." Kaitlin Perry led Centennial with eight points and Dominique Andrews had six for the Eagles (8-11, 4-5). OREGON CITY 77, REYNOLDS 20: Brooke Bullock and Kaari Guelsdorf scored seven first-quarter points each as the Pioneers jumped out to a 29-0 lead and put Friday's Mt. Hood Conference home game out of reach before the start of the second quarter. Kylie Guelsdorf finished with a team-high 11 points and Jalissa Lugo scored 10 off the bench to help the Pioneers (11-8, 8-1 Mt. Hood) extend their winning streak to five games. LA SALLE PREP 48, MILWAUKIE 32: Taycee Wedin knocked down five 3-pointers and finished with 23 points, and Emily Niebergall added 10 points, six rebounds and three steals, leading the Falcons to a Northwest Oregon Conference road win Friday over the Mustangs. Kylie Burg also scored 10 points for the Falcons (15-4, 9-0 NWOC), who went on an 18-3 run in the second quarter to turn a four-point deficit into a 21-10 halftime lead. PUTNAM 35, ST. HELENS 34: The Kingsmen edged the visiting Lions in Friday's Northwest Oregon Conference game to run their winning streak to three games. Putnam is on the road Tuesday to face league-leading La Salle Prep.